Line baking trays with wax paper. Chop and temper semi-sweet chocolate. Stir in one drop of peppermint oil. Pour the chocolate into the trays, spreading evenly with a spatula. Chill in fridge for at least 10 minutes. 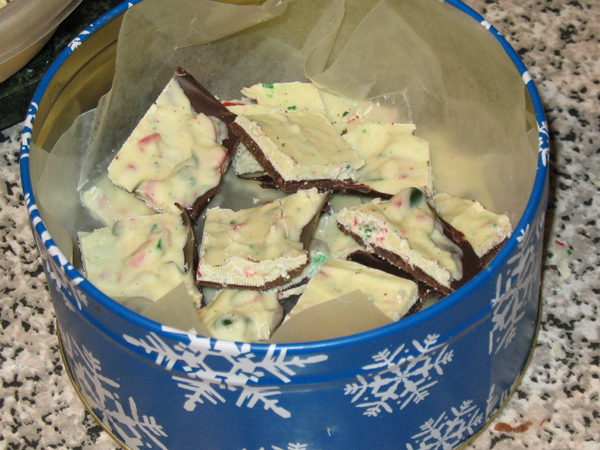 Unwrap candy canes, place into freezer bag, crush with hammer. Set aside. Chop and temper white chocolate. Stir in 2-3 drops of peppermint oil. Stir crushed canes into white chocolate. Immediately pour white onto semi-sweet, spread evenly with spatula. Wait 15 min for layers to bond, then chill for at least 3 hours. Remove wax paper from bottom and let stand at room temp for 10 min. Using heavy blade, cut into strips, then cut into pieces. Place pieces into tins, separate each layer with a piece of waxed paper. Keep in fridge. Allow pieces to sit at room temp for 10 minutes before eating. The small pieces left over on the cutting board make a great garnish for cocoa or pancakes.